Diversity & Inclusivity at NextGen is beyond a corporate agenda. It is a way of life, ingrained within the very essence of life as a NextGener. With this at the very core as a driving force, through the NextGen Meet & Greet, we take immense pride and pleasure to welcome into our fold, experienced women Tech experts who may currently be on a sabbatical / on a second-wind career journey or looking to resume their professional tech stories. We believe Happy physicians make Healthy patients – it is this belief that drives us as an organization. To truly fulfill this belief, if we are to make solutions that reach out to patients everywhere, the makers of these solutions i.e. our employees NEED to empathize and understand the end user deeply. For us, there cannot be a stronger business case for Diversity! The more diverse we are, the better we represent our end user – the patient community! Our employee feedback mechanisms have driven some pertinent and quick changes for us - changing company policy on hotel accommodations, updating our policies to be more inclusive for transgender people, revamping our website to accommodate for people with visual disabilities. At BDC our approach to Diversity has always been to ensure the impetus is thrust upon Inclusion. Conscious, small yet meaningful, steps to eliminate bias manifest into a larger culture of equitability and inclusivity. The key to ensuring Inclusivity is to be able to apply discretion on where to use a targeted approach and when to be inclusive. For instance, our Recruitment events may be targeted, but our process is inclusive. Similarly, some flexible policies may be more “used” by women (like Work-from-Home) but the applicability is uniform to all employees. Alternate models of employment: Look at the skill, not the person – something we are living by. We do have remote workers and gig workers whose skill-set, and the “virtual” connect drive their association with us. Zero tolerance for harassment of any form. The focus is on celebrations – not for a particular group or sub-section of employees. For instance: We did celebrate International Women’s Day, but the greetings, events and day’s proceedings were for both men & women. 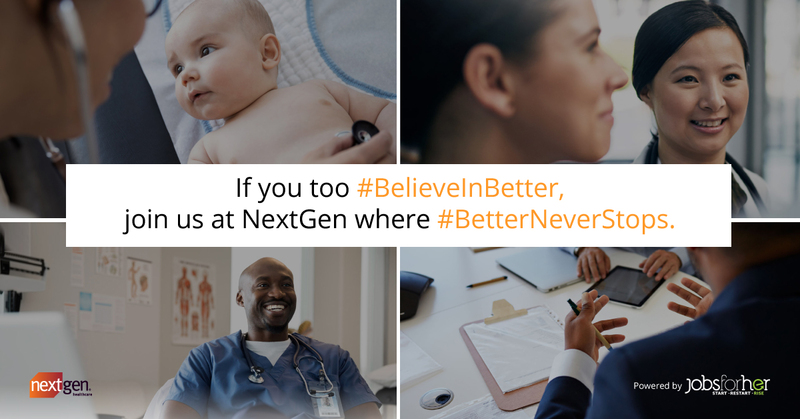 APPLY TO JOBS FROM NextGen NOW!